It’s hot outside, y’all. I don’t know what you have planned for the weekend, but it should definitely include sipping a Strawberry Rosé Slush, preferably poolside. I don’t have a pool, but sipping one of these while sitting on my porch is enough to help me imagine myself poolside amidst lush foliage. So yes, that’s how I will be spending the weekend. You really don’t need a fancy shmancy blender to make this work. My little single-serving blender was less than $15 dollars and does quite well with frozen fruit, which is quite a bit softer than ice. I did add a couple ice cubes at the end to make it extra thick, and they broke down well enough. Powdered sugar is the sweetener of choice here because it’s the easiest to dissolve in super cold liquids. Second best would probably be honey, but be aware that it is much more dense than the super light and fluffy powdered sugar, so you’ll likely need much less. Start with a teaspoon and then add more to your liking. 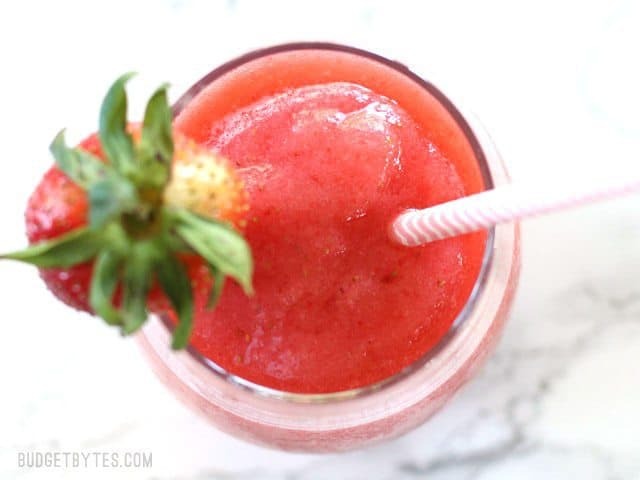 Have you made fruit and wine slushies before? What’s your favorite fruit-wine combo? Let me know in the comments below! The ingredient amounts listed below are estimates and will vary with the size of the fruit, your blender, and drink size. The amounts listed below made approximately 1.75 cups, which is either one really large drink (go big or go home, right?) or two smaller drinks (Okay, fine, this is probably a more realistic size for me). 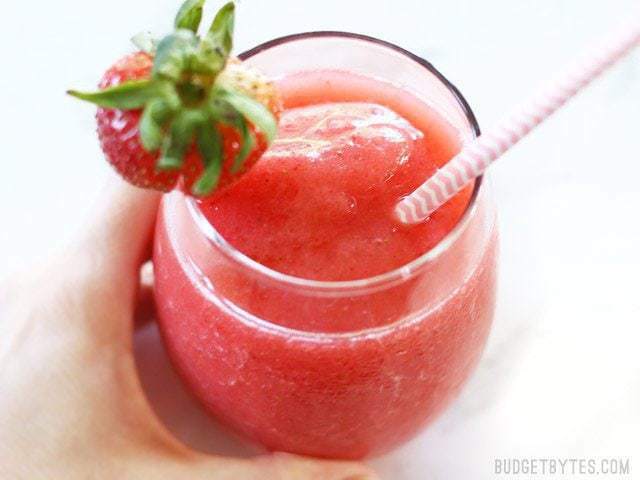 This Strawberry Rosé Slush is a fast and inexpensive frozen drink to enjoy this summer. No fancy blender or liquors required! 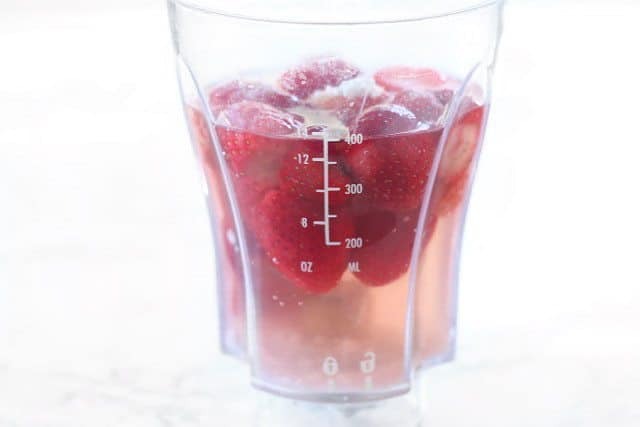 Add the frozen strawberries, powdered sugar, and rosé to a blender. 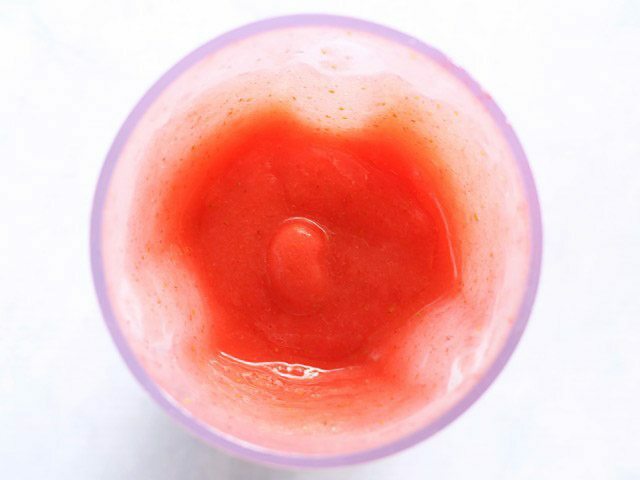 Blend until the drink is thick and smooth. 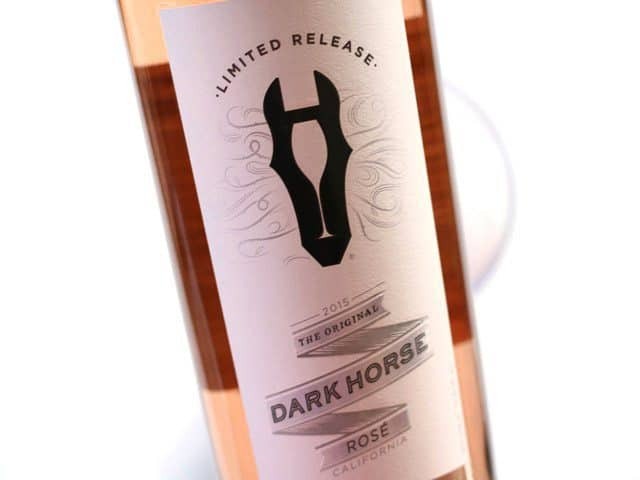 If the drink is too thick to blend properly, add a splash more of rosé. 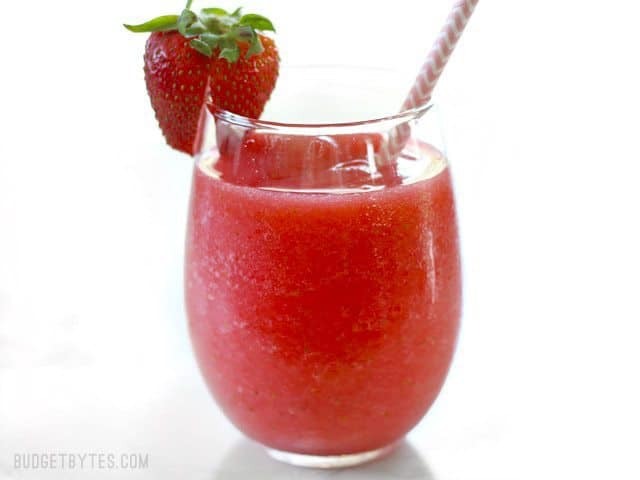 If the drink is too thin, add a couple extra frozen strawberries or a few ice cubes and blend again. Whole Foods is actually a great place to get frozen fruit. 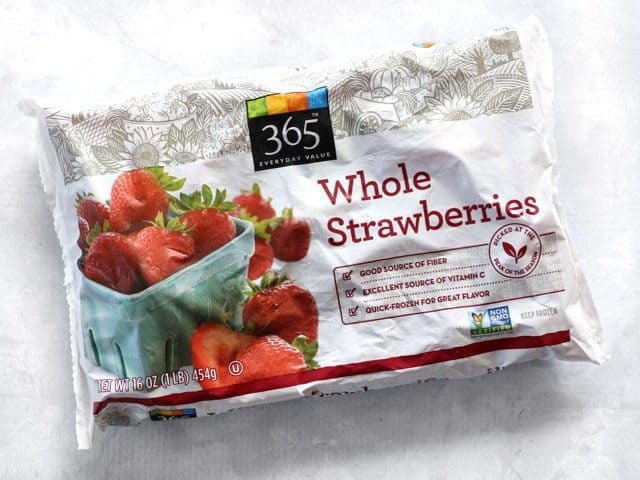 They had this one pound bag of frozen strawberries for only $1.99. Score! I used 1/4 of the bag for the drink (again, that’s either one super large drink or two smaller drinks). 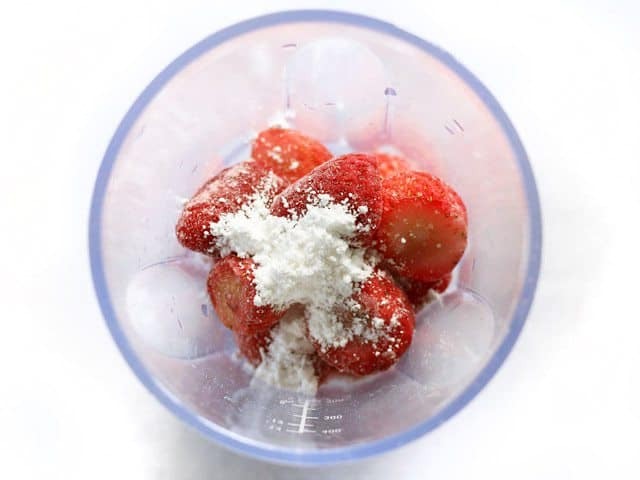 Frozen strawberries can be kind of tart, so I also added some powdered sugar. Regular white sugar can be difficult to dissolve into cold drinks, so powdered works best. I used 1 Tbsp, which seems like a lot, but powdered sugar is not very dense. Plus, with frozen drinks, you need to sweeten a little more than usual since the cold can dull your taste buds. Pour in about 1 cup of the rosé. A lot of times when I’m making frozen drinks I don’t even measure. 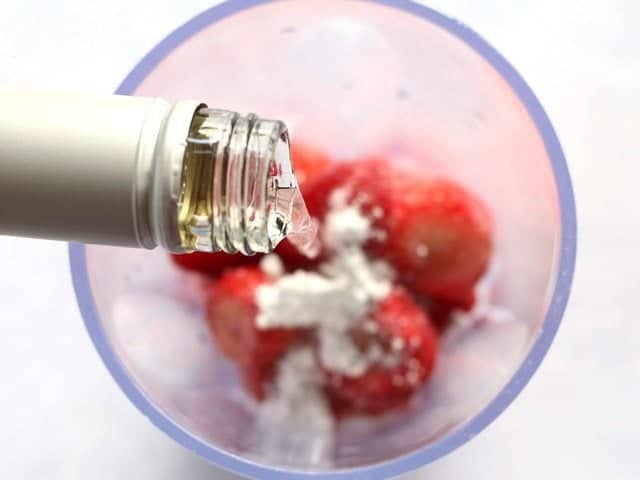 I just add my frozen fruit, then fill with a liquid just slightly above the line of the fruit (in this case the strawberries floated). After I begin to blend, if the mixture is too thick I’ll add a splash more liquid or if it’s too thin, I add a few ice cubes. The same goes for these Strawberry Rosé Slushes. Add a few ice cubes if it’s too thin or a splash more rosé if it’s too thick. Then just pour it into a glass and enjoy! Having a cute straw kind of helps. :) I got these at Target. 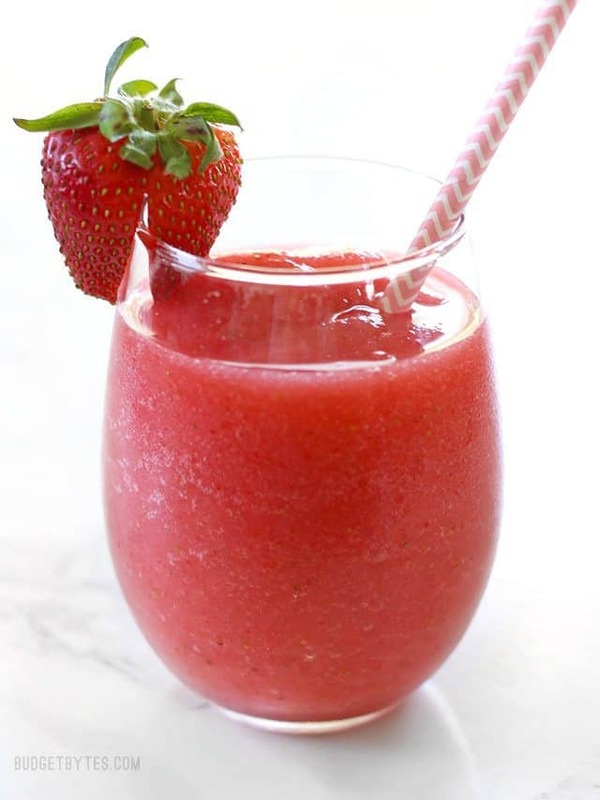 Re: non-alcoholic versions, I have found that a bit of applesauce mixed in with frozen strawberries really helps to create a daiquiri-like consistency. Interesting! Thanks for the tip!! I sub for the rose to make it non alcoholic for kids? Apple juice? Another fruit juice? Water? I actually got a free blender when I was searching online to buy one for this recipe. This is my go to after a long day. Also found that simply lemonade blueberry makes a great non-alcoholic substitute. Would it be a bit much to put some vanilla extract in this? I have a ton that I need to use and this seems like a good application for it. Maybe like 1/2 or 1 tsp? Hmm, personally I don’t think I would like vanilla with the rosé. Just tried this recipe now, before guests arrive. Used Beringer’s white zinfindal (it’s actually pink) and a splash of fresh lime. Garnished with mint. Wonderful!